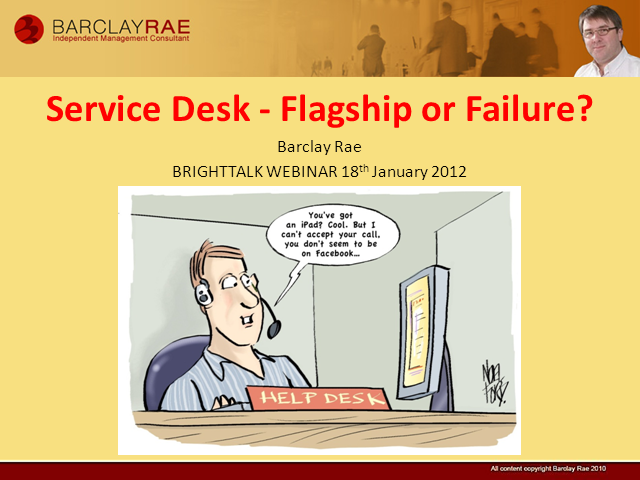 Your Service Desk: Flagship or Failure? A successful Service Desk, properly managed and integrated within a service organisation, can be the flagship and jewel in the crown of your customer relations and business value. Alternatively if your service desk is poorly run and no supported by its own organisation this is a clear sign of a dysfunctional organisation. Which applies to you? This session lays out clear messages around the definition, purpose, value and modus operandi of both a service desk and its supporting teams. The webinar provides clear strategic and operational guidance on how to make this work, based on the presenter's 25 years Service Desk experience and involvement across the industry. Title: Your Service Desk: Flagship or Failure?